Johannes Brahms was born on this day in Hamburg, Germany in 1833. Today is the 181st anniversary of his birth. The second of three children born to Johanna Henrika Christiane Nissen and Johann Jakob Brahms, Johannes’ love of music came from his father who played horn and double bass. Little Johannes was playing piano by age seven and earning money as a musician “at local inns, in brothels and along the city’s docks” [Biography.com] by the time he was a teenager.At age 20 he met German composer Robert Schumann. Schumann help his career, and Brahms quickly became friends with Schumann and his wife Clara, a pianist and composer in her own right. When Schumann attempted suicide and had to be confined to a sanitarium, Brahms helped out the desperate (and very pregnant) Clara, by moving into the apartment above the family and acting as go between from the Schumann household and the hospital. Schumann died in the sanitarium a few years later, but Brahm’s friendship with Clara continued. He relied on her to review his compositions and valued her opinions. He moved to Vienna in 1850 and in 1863 took the post of Director of the Singakademie, an a cappella group that focused on historical and modern works. He’d found his home in Vienna and lived there for the rest of his life. He traveled in summer, touring Europe for concerts and for pleasure. 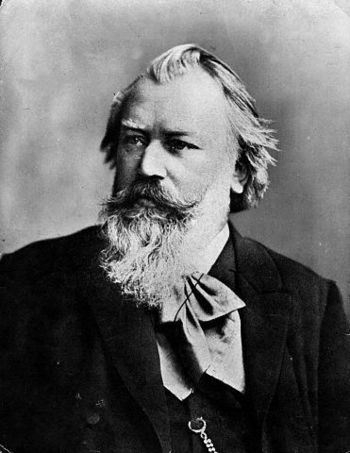 Brahms was rather famous in his old age for being sarcastic and rude to adults, but he loved children (and would often give them candy when he saw them in the street.) His music was popular and sold well, and he lived comfortably and with in his means. He was generous to his friends and his students. 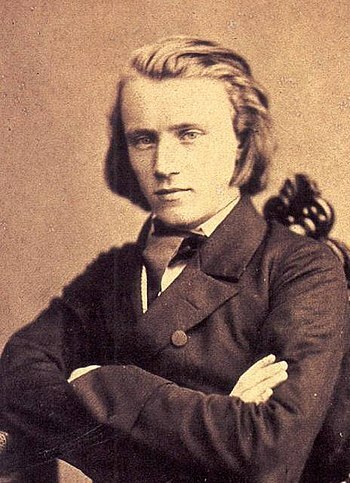 Brahms contracted Liver (or perhaps Pancreatic) Cancer and died at the age of 63 on April 3, 1897. What influence did Johannes Brahms have on music in his time as well as today? This entry was posted on Wednesday, May 7th, 2014 at 2:23 pm	and tagged with Clara Schumann, Johannes Brahms, Robert Schumann, Schumann and posted in Brahms, Music, Thought of the Day, Today's Birthday. You can follow any responses to this entry through the RSS 2.0 feed.